One of the goals of the City of Saint Paul’s Comprehensive Plan is to create public bicycle parking facilities to increase bicycling citywide. To meet that goal, the Department of Public Works offers the Neighborhood Bike Rack Program. 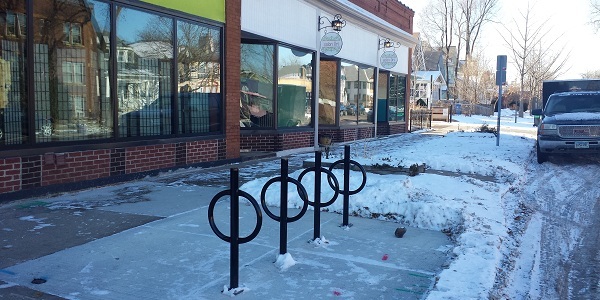 Through the Neighborhood Bike Rack Program, Saint Paul businesses and organizations can request the installation of approved bike racks on public right of way in front of their property at no cost. In return, the applicant agrees to provide snow removal to maintain access to the bike racks during the winter. In order to be eligible for the program, your business or organization must be located in the City of Saint Paul, and must be able to demonstrate a lack of space feasible for bike rack installation. Also, all bike rack installations must meet all applicable accessibility and construction standards. For details about the bike rack program, including eligibility requirements, responsibilities, and restrictions, read the Neighborhood Bike Rack Program Guide. To apply for the program, fill out the application (included in the Program Guide and linked below) and return it to the contact person identified on the form. Neighborhood Bike Rack Program Application. Once we receive your application, we will review it to determine if the basic program requirements are met. If it is determined that you are eligible to take part in the program, we will put you in touch with our bike rack vendor to develop a plan and prepare a cost estimate for the city's review. If your property is not eligible to take part in the City of Saint Paul's Neighborhood Bike Rack Program, or if the best location for bike racks at your facility is not on public property, Saint Paul Smart Trips has a similar cost-sharing program that may better suit your needs. Information can be found on the Saint Paul Smart Trips website, or by contacting Saint Paul Smart Trips by phone at 651-224-8555, extension 23, or via email at info@smart-trips.org. See 2014 Year in Review brochure for a sampling of existing installations.